Seems like everyone is wondering what they should do for the summer, or what they should do with their lives. For those out east I thought I would help you out. 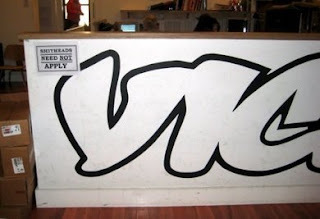 Everyone's favourite obscure Canadian publication Vice is currently hiring a sales and marketing position for their Canadian base. Not sure if its Montreal or Toronto. Get on your horse and get a job. Also if your sick of hunting the job bank and want to utilize your skills in the action sports industry check out Malakye. Featured employeers include New Era, Nixon, Oakley, Creative Recreations, Kr3w and Supra. KAWS Solo Show "The Long Way Home"
Nike Quickstrike P-Rod II High "Houndstooth"